"We have been monitoring online chatter from consumers regarding where the EOS M fits in the Canon lineup. To help your audience visualize the lineup and the EOS M camera's place in it, the following attachment has been created." 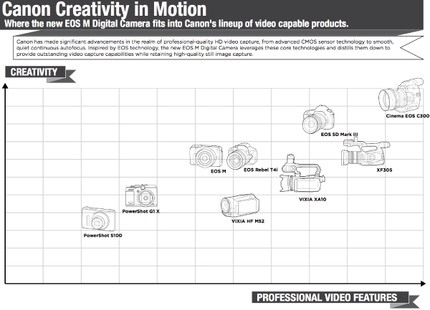 Mapping "Creativity" versus "Professional Video Features" is interesting, but I don't think that was the main question on everyone's mind after reading about the new EOS M. The main question I've gotten from readers has to be about where the EOS M fits vis-a-vis the DSLRs and to the mirrorless competition. The more I look at the EOS M, the more I see a Rebel 650D without a mirror and optical viewfinder. So, add an EVF and what do you get? A smaller Rebel 650D. Even the side-by-side position in the "video" chart Canon produced says that. Which shows how tricky the mirrorless space is going to be for Canon. The standing question is this: would replacing the Rebel 650D in the next generation with an EOS M-EVF work? The implication would be that Canon protects its low-end DSLR sales by declaring that the right mirrorless camera is the equal. But does that strategy really net Canon more sales, or does it just protect the low-end DSLR? 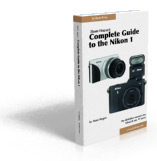 Nikon's approach has been different. It's clear that a V1 doesn't replace a D3200, but rather supplements it and establishes a new category for compact upgrades. This is the market that Panasonic promoted when they launched their first m4/3 camera: that there's a group of compact upgrade folk that don't want the size/bulk of a DSLR. These people really just want faster autofocus and better low light capability at lower-than-DSLR prices. So far, Panasonic has been proven right. Add up the small sensor mirrorless cameras (m4/3, Nikon 1) and they substantively outsell the large sensor mirrorless cameras (NX, NEX). It will be interesting to see how far, if any, Canon's entry re-tilts those results. But we need more data points. It'll be awhile before Canon's EOS M-mount strategy becomes fully clear. But it's a fairly safe bet that the next camera would go upscale from the initial one.